After brainstorming the value of IVR and how it helps agents work more productively to better help customers (we’re talking 5-10 minutes discussion of IVR, agent workload and continuous improvement processes to help them both), the Post-Millennial consumer gets it! 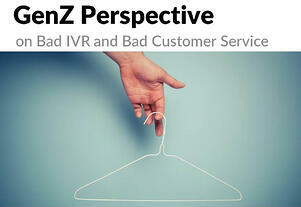 Middle Schooler first impressions about bad IVR - it's 100% on target! The customer struggles to find the help they need and have to go through all the non-relevant menus and information. In the end they may not get what they were looking for – gets close to it but then the next option or menu gets them further away. It’s too much time, dissatisfaction and they give up. Learn from your mistakes – if you aren’t “listening” to your customer phone calls you will miss what they need. For example, what are the 3 things people want from the IVR that they have to transfer out to talk to an agent to get the answer? Take less than two minutes to hear Nicolas’ GenZ perspective. South Florida’s Take Your Child to Work Day this year falls on February 2, which ironically is also Groundhog’s Day. There’s a whole blog post on that correlation somewhere, I’m sure.